The winter season has most people spending more time huddled up indoors — so use the opportunity to get crafty and make a terrarium to bring the outdoors in! Comforting and cheerful to behold and easy to maintain, we show you how you can create a tiny world of greenery in a recycled glass jar in no time. You can move your vibrant wonderland from room to room to brighten up your home, or whip up several terrariums at once and dole them out to the sure to be delighted recipients on your holiday gift list. 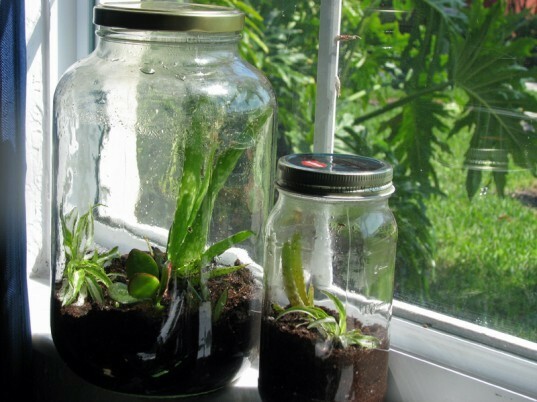 The winter season has most people spending more time huddled up indoors -- so use the opportunity to get crafty and make a terrarium to bring the outdoors in! Comforting and cheerful to behold and easy to maintain, we show you how you can create a tiny world of greenery in a recycled glass jar in no time. You can move your vibrant wonderland from room to room to brighten up your home, or whip up several terrariums at once and dole them out to the sure to be delighted recipients on your holiday gift list.